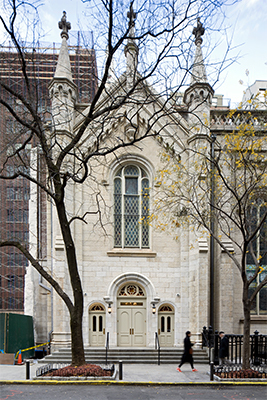 Helpern Architects worked on the Marble Collegiate Church property at Fifth Avenue and 29th Street for 17 years, starting with a 1999 renovation master plan that coincided with the church’s 150th anniversary. But ironically, the last of the extensive master plan projects – the re-construction of the South Entrance – was the first to be visible from the street level. 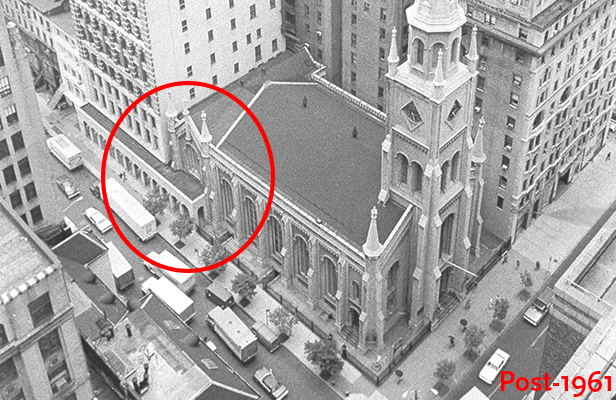 The original church building had a fine south portal, but in 1961, when Marble purchased and occupied the adjacent building for its offices, they removed everything but the entrance opening in order to join the two buildings with an enclosed portico [see Image No 4]. The Helpern design for the “new” South Entrance updated rather than replicated the original design. 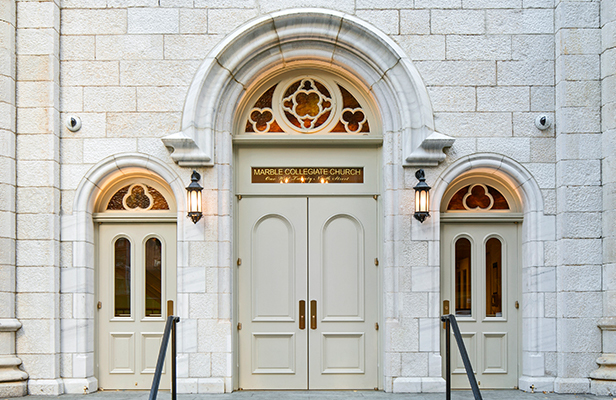 The new main doorway arch stands 15 feet high, over new mahogany double doors. Two similar, smaller arched doors on either side replace the original windows. This scheme received an uncommon unanimous first-round approval from the NYC Landmarks Preservation Commission. 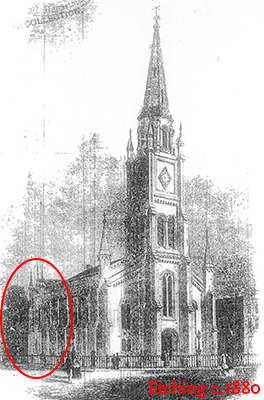 One consideration was that the original Tuckahoe Marble used for the church [the reason for the church building’s house-proud name] had not been quarried in upstate Westchester County since the 1930’s. 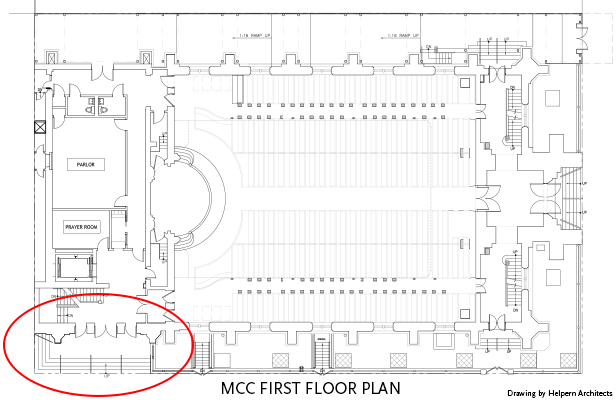 The solution was to use original marble from the unseen back of the church to patch the new south entrance – but only five pieces of stone could be “mined” this way. 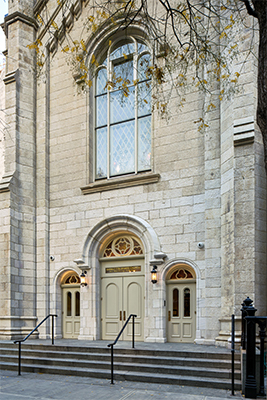 The final decision was to incorporate new marble from Georgia that closely replicated the color and texture of Tuckahoe Marble, and to “feather” it into the newly-cleaned and restored original stone on the south façade. Masons who specialize in architectural stone preservation honed the new marble to resemble the portal’s original ornamentation and tooled it to match the rough texture of the surrounding restored stones. A 10-foot section of the ornate black metal fence was also replicated. Four new, rough-textured thermal-finished steps – made of Mountain Green granite from Minnesota – descend to the street level. Within the entry, in the lobby and elevator, polished gold marble frames a new honed-slate floor fashioned in a red and black basket-weave pattern.